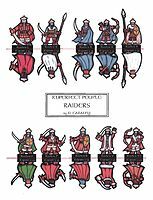 Here it is, a set of Raiders done in a Mongol - Cold Steppes type of style. Useful for raiding caravans and farmsteads. Hope you like them. Those raiders are perfect for my home-brew country full of mongolian barbarians. KARATE!! Thanks alot like always. I am detecting that everytime I look at this site, there is something gorgeous up again from you. I have the front and back inkwork done on a quartet of Desert Elves, a pair of Desert Dwarves, and my first Djinn. It will probably be my next posting. After that I have a set of Swashbucklers in the works. I finally printed off the Raiders to use as the Hinn, barbarian riders who inhabit Tunland in Forgotten Realms. But they ended up being quite red, so that they looked a bit too Christmasy. So I recolored their clothes to look more like leather. I also made up a sheet of just bowmen and spearmen. I plan to mount them on Xtea's warhorses. 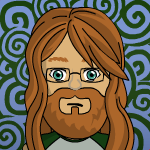 Here's an image and the recolored files. I'll post pics when I have them. Here's a pic of the spearmen on the modified palominos. I'll post more images when I set up the scenario. They look so good. I really like your way of mounting the riders on the horses too. afet I take it the slit is in the mini, not the mount? Dryw! We miss you! Come home to us! afet Nice - it looks like it will work out well! Brilliant method afet. Now I just need to concentrate on not immediately trying it out as I've got a pile of minis on my work table already that need completing.